Can A Small Business Blog Increase Website Visits? Absolutely! A corporate or small business blog is one of the best ways to share information about your products and services, current events and sales promotions or press your organization has received. A happy accident of sharing this information is that your company blog posts add relevant content to your website which offers a better chance of appearing in search engines such as Google and Yahoo. A third benefit is when you add scheduled corporate blog posts your small business website will get higher marks from the search engines because not only is the content relevant, it is current. Relevant plus fresh content equals SEO (search engine optimization) or higher search results. Not every visitor who comes to your website from a search may result in a phone call or a sale but like all advertising, marketing and sales, it’s a numbers game. The more people who engage with your blog and your corporate website the more likely you will enjoy increased company sales from your blogging. By posting relevant blog content you become the trusted source for your visitors and existing customers for information on your product or industry. There really is no on-size-fits-all formula for small business blog posting, anymore than there is a one-size-fits-all marketing plan for small business. It really depends on the goals you have set for your digital marketing. It also depends on how much time you have to feed your blog or the budget to outsource it to an marketing company. Now, there are success stories about small business blogs that have become income generators in and of themselves. If your corporate blog attracts 1000’s of daily website visits you may want to plan daily blog posts. However most small business blogs primarily serve as information tools, and as a portal to add relevant website content to increase website visits through SEO. 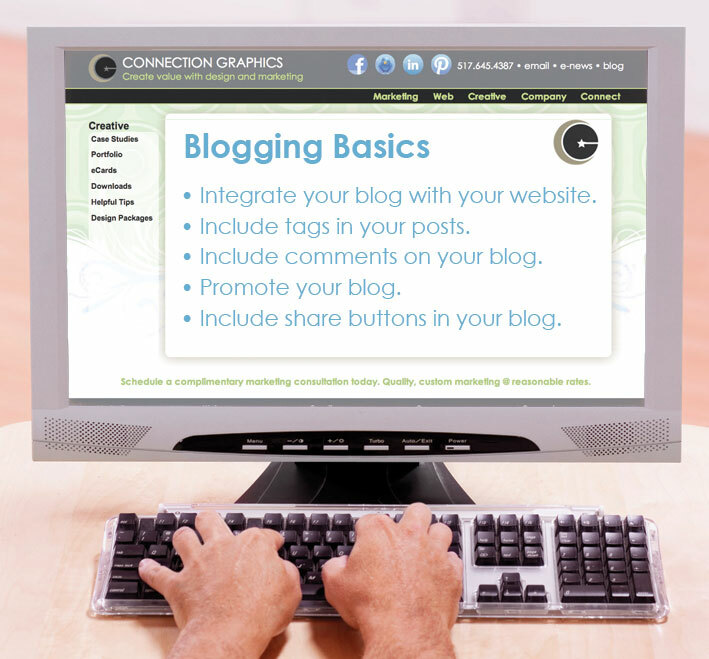 The way Connection Group approaches client blog scheduling is to determine the role of the blog in each small business marketing plan. 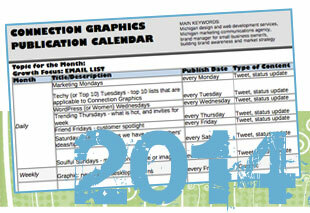 We recommend creating an editorial calendar for your blog posts. Our e-marketing packages that include blog posting, e-mail newsletters, and social media we develop a monthly plan. 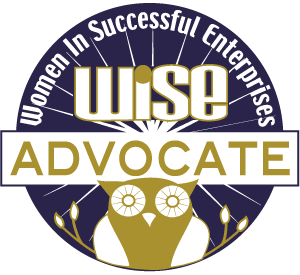 For instance if your company hosts an event for small business owners every January all of the content scheduled for the month of January will include information about the event. All of this will be in your editorial calendar. Including your blog updates in a small business editorial calendar helps you know what you will be covering each month and will help keep you on a schedule. Whether you write blog posts daily, weekly, bi-weekly or monthly a plan is a must. Each blog post should offer insight into your corporate philosophy, industry standards, details on a product or service you offer, or changes that may effect the customer. Seek content that will increase the visitors understanding of the subject. Help your customers make educated choices and purchases. Just as the visitors to your small business blog are researching, be sure to research the content for your corporate blog posts. Research but no stealing! Sharing the most current information available is important just avoid plagiarizing others work. When you are satisfied with the information you have written for your blog post, add an image. Statistics from 3M corporation and Zabisco state that 90% of information transmitted to the brain is visual, and visuals are transmitted to the brain 60,000 times faster than text! Increase your website visits by using original graphic designs, photos or videos to connect and engage with your audience. Select only images that that are free from copyright. See the article in our e-newsletter about copyright issues and images. Your blog is posted – Now, how do you increase your website visits? 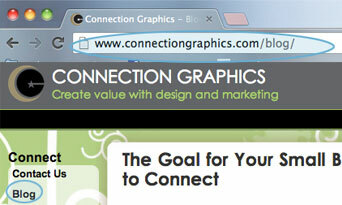 The first step is to make sure your small business blog part of your corporate website, not a separate page. There are many free blogging software options available and it is very easy to tie them into your existing small business website. Contact your web design and development company to create a seamless integration of your blog and corporate site. The biggest benefit is if you have a visitor to your blog, in the eyes of search engine tracking, you have just increased website visits. Other benefits are a custom designed blog will be consistent with your corporate brand and your complete website user interface is built into the blog so the visitor can easily click over to other website pages. Include tags in your posts. Tags help people find your information more easily when they are searching the web. For instance for this blog entry on our website I would include small business blog, and small business website design and development as tags. Because we offer those services and those services are discussed in this blog adding them as tags show our website and our blog are relevant when people search for small business blog or small business website design and development. When visitors click on a tag in our posts they will see a list of previous posts that relate to those subjects. Include comments on your blog. Comments show that you are open to feedback, good or bad. Allowing comments on your blog shows your visitors that you want to communicate with your customers. Comments may also help you determine what your visitors are looking for, give you ideas for future articles, and comments may use keywords that will come up in searches too. Do make sure you moderate your comments though! Even with strong spam filters blogs are petri dishes for spam – check them regularly. We set up our comments to be pre-approved prior to posting just for this reason. As visitors begin to interact with comments you will build a community and advocates for your brand on and offline. Include share buttons in your blog. Make it easy for viewers to share your website content. One share from a high ranking social media influencer can increase website visits astronomically. The ability to share across social media and email is how videos and blog entries go viral – this is an easy way small business blogs can get noticed. Promote your blog. When you have posted a new blog entry promote your blog in all your marketing outposts. Social media is a great platform to share your blog posts, twitter, Facebook business pages, Linkedin profiles and industry specific groups and social media channels get the information to targeted groups. Include your blog link in your email signature and add a snippet of your current blog posts to your email newsletters. Are you a small business who doesn’t have time to blog? Connection Group understands that small businesses are limited with time and resources to implement all the marketing components that will help build their corporate brands and increase website traffic. We have developed a variety of e-marketing packages to suit the variety of requests our customers need. We’re here to help you build connections and reach your target audience – if you just need a monthly blog entry, a combination of e- mail marketing, social media and blog management we have monthly packages that will suit your small businesses goals and budget. We offer a free half hour consultation to discuss what digital marketing elements will fit you best. Give us a call or shoot us an email today. We appreciate feedback on our blog content and encourage additional insights readers can share to help other visitors learn more. Please add your comments or questions below.